WHEN Sam Dolinko hauled 55 pounds of coffee cake, flat as a flapjack, out of the oven one day in 1949, it looked as though a major disaster had overtaken the little neighborhood bakery in Los Angeles run by him and his brother-in-law, William Golant. He was deeply upset over what had happened to his cake. Golant was furious. Newcomers from Chicago, they were barely eking out a living and the loss of a day’s production was a serious setback. As soon as tempers had been restored and the gloom had lifted a little, the pair set about to see what they could salvage out of the pans. Golant cut himself a piece of his coffee cake that should have been light and fluffy. Instead, it was thin and crisp. Dejected, they piled the cakes on the baker’s bench, not knowing what to do with them, and left for home. The store was left in care of a retail clerk to see about selling the various other items they had baked that day. It happened that Mrs. Ann Stern, a sister-in-law, came into the bakery and saw all the thin cakes piled high on the bench in the back room. She asked the salesgirl what they were and was told of the horrible mistake that had been made. Mrs. Stern tasted the “mistake” and decided that it had an unusually good flavor. She had an inspiration, cut one of the cakes into small pieces, and took it into the store to let some of the customers taste it also. The result was that all of the cakes were sold within a few hours. Later in the day Golant and Dolinko returned to the store for their late afternoon chores. They were horrified to find that the cakes were all sold and were certain that what little business they had would now be lost forever. Once more word went around the neighborhood and soon the bakery was selling 100 pounds of cake a day, nearly double the previous output. Today, less than four years later, their thin cake-roll under the name of Baker Boy Confection Roll has zoomed from a neighborhood delicacy to a nationally distributed item. The firm is grossing more than $2,000,000 annually on this one product. The volume of business is limited only by Baker Boy’s inability to keep up with the demand. At every step along the road of expansion, Baker Boy’s producers learned that something of the cake’s original charm and flavor was lost whenever a machine was brought in to substitute for a hand operation. Thus, even though costs are high and production is limited, the company continues to use old-fashioned methods. The dough, mixed with a secret recipe, is kneaded and rolled by hand. Fresh creamery butter is hand-applied to the sheet and then crushed and toasted walnuts, cinnamon and brown sugar are sprinkled on, again by hand. Five men are needed to roll the sheets of dough into 17-foot lengths until it looks like white pipe. This roll is then cut into sections by hand and no two loaves are exactly the same size. The loaves are baked—1,000 at a time—in a reel-type oven. The average commercial cake is baked about ten minutes but Baker Boy stays in the oven for one hour and 45 minutes. It is impossible to describe Baker Boy’s delightful flavor. Customers from all European countries claim that they have eaten something like it in their homelands at one time or another. Their mothers or grandmothers had made it in Vienna or Copenhagen or Dresden or Berlin. It is this familiar flavor that seems to sell the product. Milton Katz, who took over sales for the company, readily admits that the flat cake promotes itself and he was among the first to be sold on its possibilities. The company’s experience with Los Angeles’ huge May Company department store is typical of the way the flat cake caught on. The May buyer was enthusiastic but he ordered only 20 pounds as a test. Late the same morning that the cake went on sale, the buyer called the bakery to rush them another 100 pounds. Before closing time the store had ordered 300 pounds for delivery next morning. The bakers worked all night to fill that order. Some time later, in a one-week promotion, the May company sold 4,200 pounds of the cake—an average of 700 pounds a day. Meanwhile it was necessary to have a new baking plant and this young company needed financing. It was the same Mrs. Stern, who had sold the original batch of the “mistake,” who came up with the necessary funds. She had such faith in this cake that she talked her husband, Irving Stern, into investing the necessary money for the new plant and taking over the financial matters of the company. It was then that Katz hired route men and soon 4,000 stores in the Los Angeles area were handling the Baker Boy cake. As production mounted, Katz began distribution throughout California and then went into neighboring states. At the end of the first year in the new plant, the firm had grossed $130,000. By the end of the second year, as distribution spread automatically, the gross jumped to $1,000,000. Today the Confection Rolls are pouring out of the ovens of two plants at the rate of 5.000,000 pounds a year for a gross of over $2,000,000. But this growth wasn’t realized without a series of difficulties. In 20 states, it was discovered, the Baker Boy trade name had been registered by other firms. Thus the company had to market its cake under the Baker Boy name in 28 states and elsewhere call the product Vienna Boy Confection Roll. Recently, the company completed the purchase of the copyrights for the name Baker Boy all over the United States. Another of the problems was shipping. Because the cake is so crusty and tender and because of its weight, it suffers considerable breakage in transit. Once a 30,000-pound order shipped from Los Angeles was hopelessly crushed on its way to an Eastern distributor. Only stronger and more expensive packaging overcame this trouble. A product as successful as Baker Boy naturally has had imitators, but none of them has been able to duplicate or improve on the original flat cake. One Texas firm which thought it had discovered the secret lost $60,000 in short order when it marketed its copy cake. 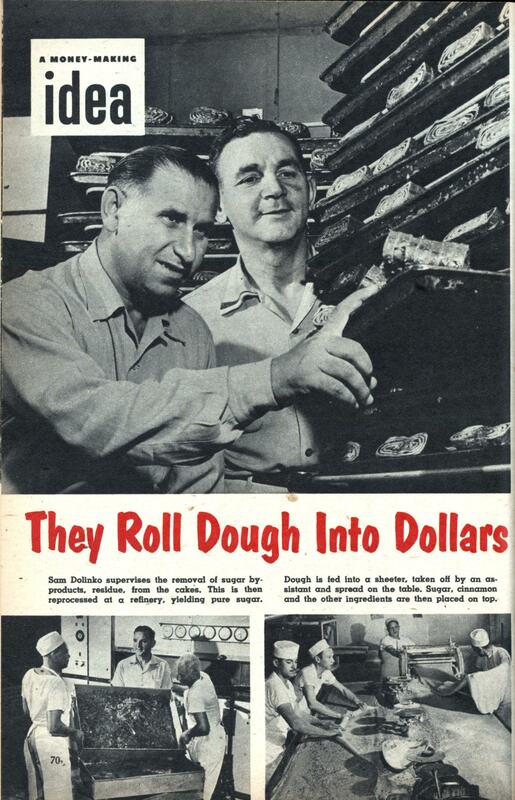 The owners were glad to unload their plant to Baker Boy Bakeries who are now operating it to supply Texas and surrounding states with the genuine Confection Roll. More disturbing than imitators is unavoidable waste within the bakery itself. Since the cake is crusty and tender, some of it crumbles when sliced. At full production this waste amounts to as much as 1,000 pounds a day. In addition another 1,000 pounds of caramelized sugar drips into the ovens daily during the baking process. For a while the crumbs and drippings were thrown away but Baker Boy executives figured there must be some way of salvaging something out of a ton of edible material. One day an employe scraped up a handful of crumbs from the slicing tables and popped it into his mouth; it was delicious. Thus was born the idea of packaging the crumbs for use in desserts, ice cream toppings and crusts. The package was priced at 39 cents but for some unexplained reason it never did catch on. 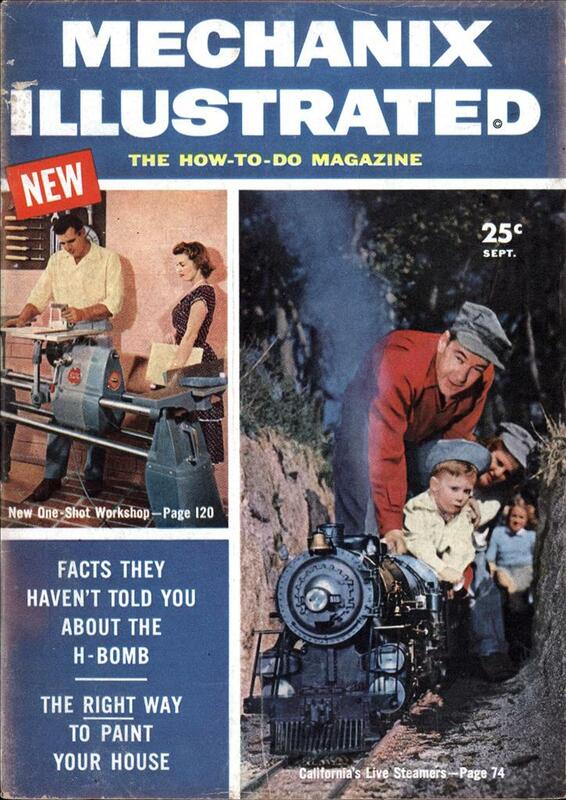 They still wonder if the failure was due to something distasteful to homemakers in the idea of using crumbs. Some months later the bakers learned by chance that a refinery could reprocess the drippings into sugar. For every 100 pounds of drippings, 58 pounds of pure sugar could be extracted. The reprocessing cost the bakery only two cents per pound for the usable sugar. Shortly after this incident a candy chemist dropped into the bakery to pick up some loaves of cake. He noted the drippings, tasted some, and exclaimed: “Say, I’ll bet this could be made into a wonderful candy caramel.” At this writing he claims he has almost perfected a candy as different and as good as Baker Boy cake. But growth hasn’t changed an old neighborhood custom in the poorer section of Los Angeles where the original plant is located. Every Friday afternoon is Baker Boy Day for the kids and each youngster who shows up gets a couple of free slices of cake.